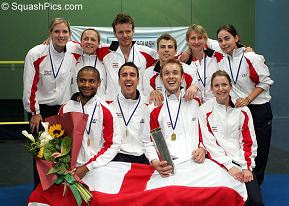 Congratulations to the England men's and women's squash teams, who have taken their respective European team titles. The tournament - this year held in Riccione in Italy - saw both English teams defeat Dutch opposition to become champions. Sadly, none of the quality British press carried the results on the following Monday. Well done, especially to the women - how many times in a row have they won now? Holy Crap, I had no idea we were so good at Squash! I am totally going to crowbar some squash in to my blog from now on.